Anyone who's been cheated on by their man has probably heard or read many quotes about lying boyfriends. They can help, they can hurt, they come from many sources, and prove one thing: as long as there have been boyfriends, some have lied. Whether you're turning to quotes as a way to reflect on your own experiences or as a way to commiserate with someone else dealing with a lying boyfriend, the right quote that sums up the experience can help you feel as though you're not alone. When someone else puts into words what you're thinking, you can take comfort in finding the right quote. Most quotes about lying to someone you love mention pain in one way or another because it's painful to be lied to by someone who is supposed to have your best interests in mind. A lie from a boyfriend is like a stab in the heart. A boyfriend's lies are wounds not easily healed. Nothing stings like a boyfriend's lies. A lying boyfriend isn't worth the pain. Hurting me with lies is a surefire way to make me end things. 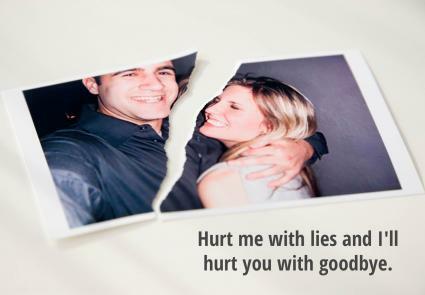 If a boyfriend thinks I'm going to accept his lies, he's mistaken what a hurt woman can do. I'm willing to leave a boyfriend who is willing to hurt me with lies. I'm unwilling to steep in the pain caused by a boyfriend's deceit. I've reached a point in my life where I'm not willing to accept the pain of a lying boyfriend. Lying boyfriends who are willing to hurt people are children - and I'm not looking to adopt. Lies and pain aren't worth it - not matter how hot he is. He should make me happy, not pained from lies. A boyfriend who hurts his partner with lies isn't ready to commit. Lies hurt - and I have a low pain tolerance. The truth may hurt, but lies are agony. Trust can be quickly dissolved once lies are revealed. A trustless relationship probably isn't destined for success. If he'll lie about the little things, who is to say he won't lie about the big ones? Lies from a boyfriend erase any truths he's told. If I can't trust my boyfriend to tell me the truth, why should I trust him with my heart? For every lie a boyfriend tells, there are probably many more that you didn't catch. If he's willing to lie to my face, what is he doing behind my back? Trust is earned - a lying boyfriend has only earned an invitation to leave. My boyfriend should have my back - not be a lying back-stabber. I can't love when there are lies. Trust is earned, but lies from a boyfriend shatter trust. Lies are the desperate attempts of a child to avoid being a man. Hurt me with lies and I'll hurt you with good bye. A boyfriend's solitary lie is probably covering up many more lies. I won't trust a lying boyfriend any further than I can throw him. He wants me to trust him after lies. He obviously doesn't realize I know my worth. Lie to me and we're done - I don't have time for a trustless relationship. To give an idea of the breadth of literature available about prevaricating paramours, keep in mind that the story of David and Bathsheba in the Old Testament is a tale of a boyfriend lying in order to be with a woman - whereas the Def Leppard song Love Don't Lie is about how a loving relationship can't include lies. Songs, poems, philosophies, plays, movies, all have something to say about the experience of being lied to. These can be blues songs about how a "man done me wrong", vituperative soliloquies from Shakespearean characters in his romantic comedies, or simply a movie quote from something like Thelma and Louise, the story of two women wronged by just about every man they come across in the movie. "I'm not the least bit sorry that creep is dead, I'm just sorry it was you who did it and not me," is a powerful indictment what the fate of the lying and abusive men get in that story. The one theme that often gets reiterated in these quotes is that the damage done by a lie is not limited to the lie itself - it is to the trust that is damaged, often permanently, when someone believes a man loves his partner but then finds out that belief is wrong. Getting past that wound is almost impossible according to many quotes, and even more say that it is silly to try. If the story of Thelma and Louise wasn't enough, there are quotes from people such as Cyril Connolly, who warns that in women, revenge is most often set alight by "male thoughtlessness." Lying boyfriends should take that to heart and consider that the consequences of not telling the truth can involve more hurt than the feelings of their girlfriend. "Hell hath no fury," as Shakespeare put it. 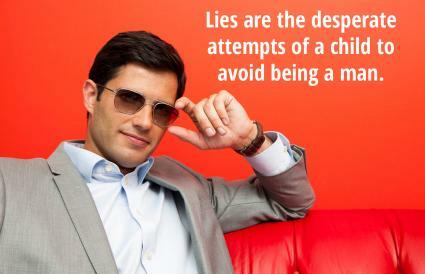 The abundance of quotes about lying boyfriends points to a prevalence of these types of men. Perhaps the biggest benefit of these kinds of quotes is that they may make someone, somewhere, hesitate the next time they are about to tell a lie to someone who loves them.